I love when a major ice cream company takes a chance on a whacky flavor. I love it even more when I don't have to pay for said whackiness. That's right, I had a leftover Turkey Hill coupon that was set to expire 12/31/09 and I couldn't let it go to waste. Thankfully, the Shaws I was had a decent selection of Dynamic Duos and I've been meaning to give the Duos a second chance even since my bizarre run in with their PB Explosion. 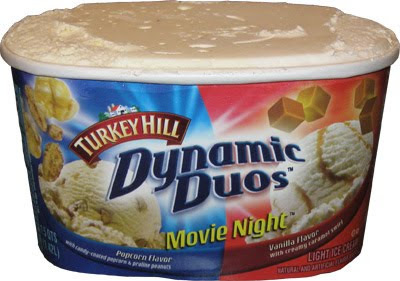 Behold, Turkey Hill's movie night ice cream. The red side is the rather tame sounding Vanilla flavor with a creamy caramel swirl. The blue side is the much more ambitious sounding Popcorn flavor with candy-coated popcorn & praline peanuts. I know many of you haven't met Turkey Hill ice cream, but no matter what brands are in your freezer aisle, I'm guessing Popcorn flavor would get your attention. Now my daughter is usually a huge fan of Turkey Hill, but she wanted no part of the Popcorn flavor. If you've read this blog long enough, you know she rarely turns down anything, but as soon as I said what I brought home she quickly responded with "that's disgusting". Ok, here is what she is afraid of. On the left, you will see the distinct (yet mild) yellow coloring of the popcorn flavor. It smells like popcorn too. The green circle is one of their "candy coated" popcorn pieces. I cant say I really tasted any sweetness, so I'm not sure where the candy coating went. 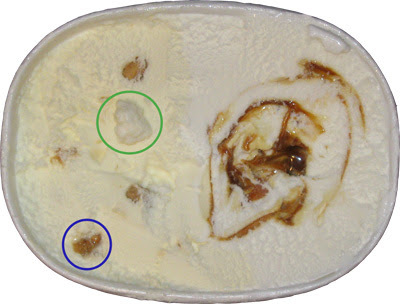 The blue circle is one saucy looking praline peanut. The other peanuts you see look pretty dry in comparison. I made the mistake of eating that saucy bit all by itself and found myself gagging on a wad of salt. Very unpleasant. On the right side you see the vanilla with the caramel swirl running through it. Now, they said it would be "creamy" and they meant it. I'm not sure what you do to make caramel not freeze, maybe you crank up the salt content, but I love when companies do this because you get a cool sundae vibe because the caramel tastes more like a topping than a swirl. The swirl has a decent flavor to boot. The whole right side is just a nice take on a standard flavor, and in retrospect, I'm thinking it belongs on a brownie or something. Now let's get back to our strange little popcorn friend. Overall I'd say the whole think tastes like the buttered popcorn you find in those Christmas tins from the mall or get from one of your company's vendors. I've never been a big fan of that kind of popcorn because it's never super fresh, and don't even get me started on how they don't make fresh movie theatre popcorn anymore even though they charge $5 a bag. Sorry, getting side tracked. There is no arguing that this is popcorn flavor. Not sure how they did it, but there's no denying the flavor is popcorn, it just doesn't work for me. Maybe I would like it more if it tasted like fresh popcorn, but I don't think that would be enough to win me over. I just don't know what urge this flavor would satisfy. When have you ever wanted a bowl of popcorn with your ice cream? Maybe I'm just biased from a lifetime of eating pretzels with my ice cream. Oh, and my daughter did try -one- bite of the popcorn side... and then she went back to enjoying the other half of the dynamic duo. Seriously?? One of my favorites I can no longer find! Bring back the popcorn! !